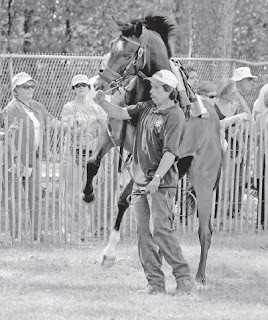 For the past 70 years, the Aiken Trials have been an annual Aiken tradition. The trials themselves are a day of races held at Aiken’s downtown Training Track. The card traditionally includes sprints for untried 2-year-old horses that have never seen a crowd before, as well as separate, longer contests for older horses. The races generally mark the end of the winter training season, and often serve as the young horses’ last serious workouts before they leave to train and race at major racetracks around the country. Many top horses get their start training in Aiken, and the horses that race at the trials might one day go on to the most prestigious races in the country – the Triple Crown races or the Breeder’s Cup, for instance. The Aiken Trials, which were held this year on March 17, are the first leg of the Aiken Triple Crown, which runs for three consecutive Saturdays and also includes the Aiken Steeplechase and the Pacers and Polo match to benefit the University of South Carolina Aiken. All three of the Triple Crown activities are as noteworthy for the atmosphere they provide spectators as they are for the events themselves. This year, as always, tailgaters lined the homestretch, some with simple picnics, but many with elaborate spreads, including quite a number with a St. Patrick’s Day theme. Some of the spectators were genuinely interested in the horses, hoping to catch a glimpse of a future Kentucky Derby winner in his first unofficial race. Others were more interested in the party. Although there is no sanctioned wagering at the Trials, pretty much every group had its own informal betting pool, and savvy handicappers knew which trainers and which jockeys were the most likely to come home with a win. This year, there were six races at the Trials, three for untried 2-year-olds, two for 3-year-old maidens, and the City of Aiken Trophy for winners, 3-years-old and up. The three races for 2 years olds were quarter mile dashes from the starting gate at the top of the homestretch to the finish line in front of the viewing stand. 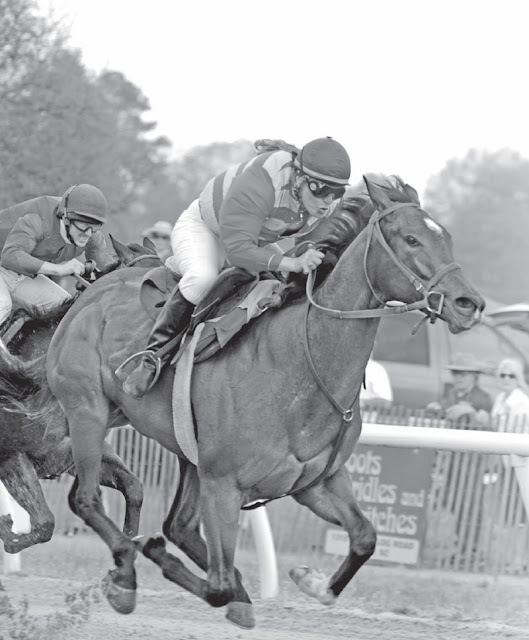 The races for older horses were 4½ furlong contests that started in the backstretch. For the past three years the Trials have also included a 300-yard polo pony race from a standing start. Although this race has been a crowd favorite, it was not on the card this year due to the difficulty of finding enough entrants that are ready to run three weeks before the start of the polo season. The first race was the Gaver Trophy for 2 year old maiden fillies. This race was a training race exclusively for horses trained by Tim Jones for Darley Stables, and it was won easily by Korat, a bay filly ridden by Kate Raines. The third trial, the Post Trophy for 2-year-old maiden colts, was also a Darley training race. This race went to Thane, a dark bay colt ridden by Corin Mason. Competition was hotter in the second trial, the Coward Trophy for 2-year-old maiden fillies. This race had a card of five entries, including two horses from Dogwood Stable, which is a world-class, Aiken-based outfit and a perennial Trials favorite. The most memorable horse in the race was a tall bay filly with a star, owned by Carrie Frommer and Dr. and Mrs. Thomas Bowman. The filly, not yet named, was a nervous type to say the least. She was a handful in the paddock even before the riders arrived, and once her rider, Mikki Fincher, was hoisted up, she rarely seemed to have more than one foot on the ground at a time. But horse racing is a test of speed, not of manners. Once the filly broke from the gate and started down the straightaway, she didn’t need to touch the ground. She streaked past the other horses, beating them by several lengths. After the fourth race, the starting gate was moved to the backstretch. The three longer races started out with a bit of drama. In the von Stade Trophy, Jessica Shultz, riding Gus Schickendanz’s Well Played, broke sharply and opened up a big lead going into the turn. It was a good thing she was so far ahead of the field, because the right stirrup came off her saddle, she lost her balance and fell. She was fortunate on two counts: first, she was unhurt, and second, she had plenty of time to get up and out of the way before the rest of the horses came barreling by. Well Played continued the race on his own, flying past the crowd so close to the outside rail the spectators could have touched him as he rocketed by. Although he crossed the wire first (and ran quite a bit more before he was finally caught) the official winner of the race was Man of the World, owned by Carolyn Vogel, trained by Wes Carter and ridden by Steve Tranium. Six horses, all experienced campaigners, broke smoothly from the gate of the 4½ furlong race. Friscan, a chestnut gelding owned by Dunbarton Stable, trained by Cary Frommer and ridden by Mikki Fincher, powered to the lead and looked like he would run away with it all. But Salvador Torres, riding Mobil Unit, owned by Gus Schickendanz and Don Howard, had something left in the tank. He urged his horse forward in the homestretch and managed to catch Friscan just before the wire to win by a head. The 70th running of the Aiken Trials was a success by any measure, showcasing the horses training in Aiken and giving the public a chance to see them before they make their first official starts. Most of the horses that ran on that day have shipped out by now, and many are getting ready for their first pari-mutuel contests. If any of the 2-year-olds that made their first public appearance at the 70th Trials make it to the big time, spectators will have some special memories to cherish.